It was such a lovely Spring day yesterday, the flowers have already started to bloom in February!! I see some of the photos other blogger friends are posting, and it is still snowing with freezing temps!!! Hang in there my friends, March is just around the corner!!! The only thing that came to mind for lunch was a Green Salad. I remembered in one of the shows he made a delicious Sun Dried Tomato Dressing. I had most of the ingredients, well except for the Croutons but that’s ok because it gave me the chance to run out with Charlie and pick up a package. So, I made it and it was just so scrumptious!! 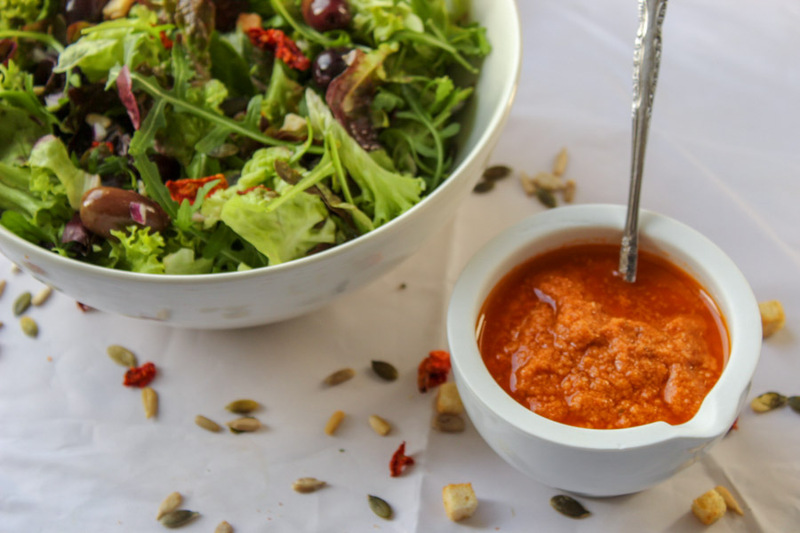 This is a must try if you love Dressings!!! In a large bowl add in all the ingredients and whip until it forms into a thick sauce. Once that is done place into the fridge for about 1/2 hour. Top Green salads with dressing along with your favorite Croutons. Love sun-dried tomatoes and with lime juice. Great combination. Looks so beautiful & delicious!